'The Smithy' was built in 1891 and is located on what is regarded to be Penketh's most sought after historical private roads positioned off Farnworth Road which eventually leads to the Brookside Farm, a unique detached residence that boasts plenty of character and sits on a third of an acre of private gardens which must be viewed to be truly appreciated. Enjoying a versatile layout that will suit many buyers needs but also offering the opportunity to be adapted to a potential buyers requirements, this wonderful home enjoys many original features to include original ceiling beams and a stunning exposed brick fireplace in the formal living room but has also been enhanced on all floors to allow for modern living throughout. 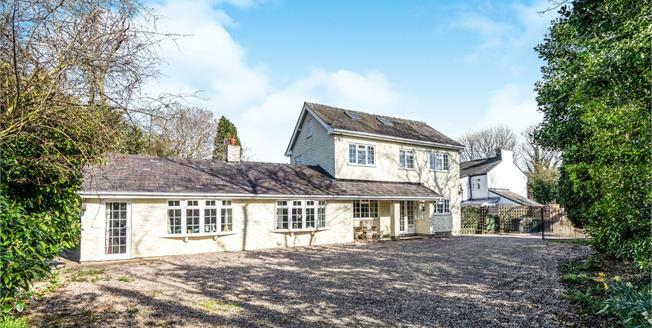 The ground floor accommodation has seen the addition of a large extension to the side which now offers a dual aspect family/entertaining room which we feel will impress all buyers and could easily be converted to a self contained studio room if required as a potential 'granny flat'. A stunning living room measures over 18 foot in length and again enjoys a dual aspect with plenty of natural light exposing this fantastic room with its original feature fireplace and modern decoration. A formal dining room is accessed off the large entrance hallway opposite the farmhouse style kitchen which boasts a separate utility room to appeal to the modern buyer and again boasts light streaming through the dual aspect windows. The first floor comprises of three west facing bedrooms with the master bedroom having access to a walk-in dressing room/wardrobe and its own en-suite shower room and a modern bathroom serving the remaining bedrooms. The upper floor features a large open plan room which measures close to 29 foot in total and provides a wonderful potential guest-suite complete with its own living area, bedroom and a small dressing area/study room in the centre and would be ideal for a teenager, therefore completing its family brief. Beautifully tended lawned gardens surround this great home benefiting from a large gravelled driveway with gated access allowing off-road parking for many vehicles and leads to a detached double garage with attached workshop.